Jeopardy Style: What are new shoes, party lights, and an air mattress? If you answered "necessities for a Gentry camp out," then you're right! 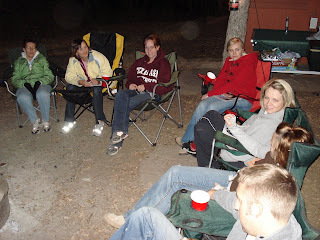 Last night we went camping with our Sunday school class at Mineral Wells State Park. Everyone says it's a great place to climb and rappel, however I am a big chicken so things like that don't really get me as jazzed as they do say, people whose initials are BWG. 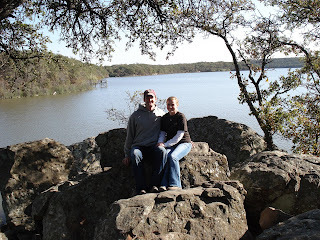 He e-mailed me at work yesterday morning to say he thought he would probably find out a lot more about me by taking me camping. I replied, "Exactly what do you expect to learn that you don't already know?" to which he said, "Good point." Anyone who knows me knows that I am not really a fan of nature, I don't like being cold, and I can't stand getting dirty. So camping is basically my own Perfect Storm. Here are the pictures...the proof that I braved the storm and lived to tell about it. And don't tell Brad, but I had a good time. 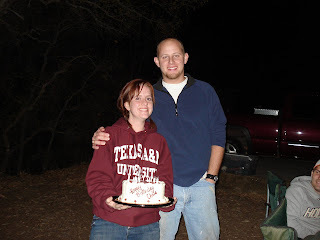 Celebrating Chris's birthday with an Aggie cake! 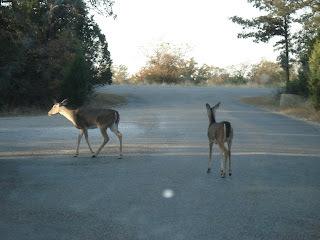 I saw Bambi and his mom out running around this morning.